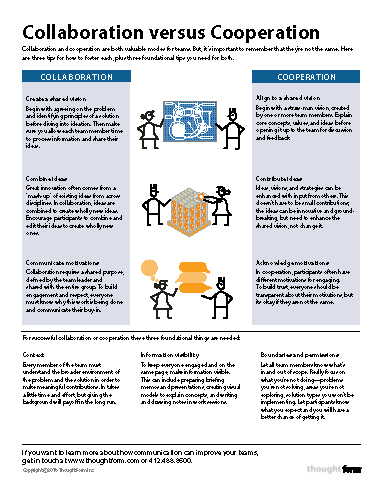 Collaboration or cooperation in the workplace - ThoughtForm, Inc. Collaboration is a very hot topic in many organizations today. Leaders are looking to breakdown silos and encourage diverse teams to work together. Collaborative cultures have been attributed to greater productivity, increased innovation, and improved employee satisfaction. The buzz and coverage in the business press of this research shows just how important fostering collaboration has become to many businesses. And it’s hard to argue against collaboration. Should we encourage teams to be cutthroat competitors, lone wolves, conspiratorially secretive and closed-off? Of course not. Collaboration often gets touted as a cure-all for many organizational problems. However, there is growing evidence that it’s not always beneficial. What goes wrong with collaboration? To be successful with collaboration, the first step is to understand that it isn’t always the right tool. 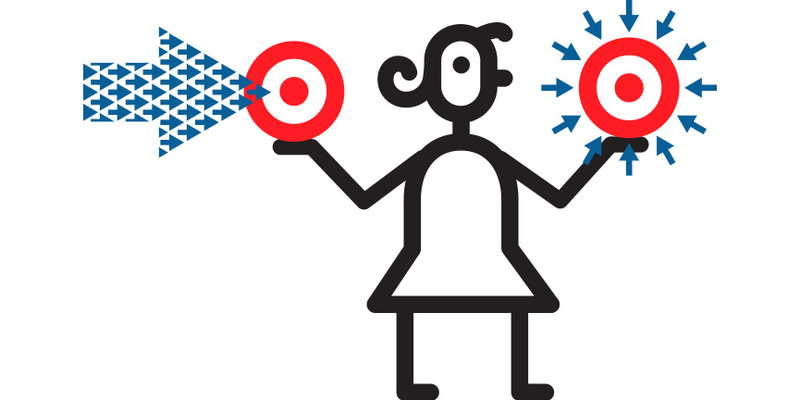 Collaboration can have downsides and some tasks don’t benefit from multiple heads. For instance, studies have shown that brainstorming actually produces less original ideas than individuals working on their own, due to group dynamics. There is a reason why we have idioms such as the dreaded “design by committee” or “too many cooks spoil the broth”. Additionally, tasks that require deep and specialized knowledge, or great accountability often benefit from a single perspective and focused work. And while collaborative teams can sometimes have superior quality solutions, they often arrive at conclusions much slower than smaller, less diverse teams. Gathering and taking all of those points into account takes time. As Wharton professor Mathew Bidwell says, the matrix organization “slows things down a lot. You get great decisions, but they take forever to make.” Additionally, collaboration can be a major time investment for high-performing employees who are in-demand to collaborate with. There’s even evidence that collaboration causes increased dishonesty among participants! With growing complexity and demand for innovative ideas, if collaboration isn’t the right answer, what is? Researchers at UNC think we should do a better job of distinguishing between collaboration or cooperation. Collaboration should not be confused with cooperation. Cooperation is when each person on a team develops his or her own plans and shares those plans with the team. There may be joint discussion, but the focus remains on individual actions and achievement rather than on a collective strategy. Collaboration is when individual goals are subordinated for collective achievement. Joint discussions are focused on the give and take about strategies and ideas, and the outcome often leads to new ways of working (Ashkenas, 2012). When is the right time for collaboration? Collaboration is crucial when multiple perspectives must merge together in order to find an integrated solution to a problem. Apply collaboration when an organization needs to create something new. When is the right time for cooperation? Cooperation is best when a single individual or team has the primary ownership and information, but needs help supporting and operationalizing. Apply cooperation when an organization needs to improve something that already exists. Whether you want to work in collaboration or cooperation, good communication is the key to tackling complex projects. Communication, both written and verbal is how two or more people share information, knowledge, and ideas. And as George Bernard Shaw famously said, “The single biggest problem in communication is the illusion that it has taken place”. So, don’t think that others understand just because you told them. Great communication doesn’t just help others understand—it clarifies and improves your own thinking and ideas. Download our white paper to learn more about choosing collaboration or cooperation and how to foster each.